Because of its varied landscape, the Spanish island of Gran Canaria (The Canary Islands) often goes by the nickname “the little continent”. There are tropical forests, mountain ranges, even a desert, all in an area of barely 1560 square km. It is here that Festival Internacional de Cine de Las Palmas de Gran Canaria, (Las Palmas, for short) takes place. This festival specialises in the kind of cinema that, far from the mainstream, could be found in any corner of the world. In recent editions of Las Palmas, there has been a justified inclination toward Asian cinema, with a tendency towards films from China, Korea, and Thailand, although there has also been an inclination towards films from Brazil, and this year, from Morocco. The festival, however, doesn’t just limit itself to showing new films from other countries, but also presents tributes to filmmakers of international prestige. In 2006 the festival shone with tributes to the acclaimed Apichatpong Weerasethakul and Jia Zhang-ke, and to top it off, they screened a comprehensive program of the works of Chris Marker. In summary, Las Palmas is distinct for the quality of its careful programming, despite, or perhaps precisely because the festival looks beyond the mainstream, and toward a more varied cinema. On this occasion, and for the third consecutive year, Las Palmas featured a focus on the thriller genre. 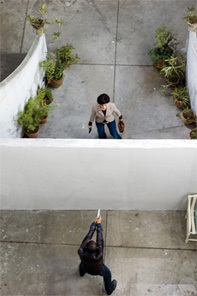 If last year’s retrospective was dedicated to European productions, 2007’s program was dedicated to the surprisingly diverse genre of the Asian thriller. Johnnie To’s die-hard fans could again see the successful Hak se wui (Election) along with its recent sequel, Hak se wui yi wo wai kwai (Election 2), and also discover his Fong juk (Exiled). In this section were also screened films by Seijun Suzuki, Shohei Imamura, Kim Jun-jung, Prakash Jha, and Danny and Oxide Pang. This selection, representing films from Hong Kong, Japan, South Korea, Thailand and India, revealed fertile creativity, both in formal strategies and narratives, in a genre in which it seemed as though everything had already been said. The festival’s other Asian substantial program offering was the tribute to Hirokazu Kore-eda, the Japanese director who became famous internationally for his film Dare mo shiranai (Nobody Knows). On offer was all of Kore-eda’s directorial work, including his rarely-screened documentaries. The public also had the chance to see his most recent film Hana yori mo naho (Hana), a unique comedy set in the 18th century, which challenges the conventions of the samurai film by having a clumsy warrior as its main character. In the official section, this year’s deserving winner was Asghar Farhadi’s Chahar shanbeh souri (Fireworks Wednesday), a complex drama told through the eyes of a girl who is hired as the family maid shortly before the Iranian New Year. Young Rouhi, who is finalising her wedding preparations, witnesses the anxiety of her boss, a woman who is convinced that her husband is cheating on her with a neighbour who lives in the same building. Fireworks Wednesday subtly contradicts the expectations of a western audience who are used to seeing the kind of Iranian films that tend to criticise the treatment of women in Muslim countries. Firstly, Morteza, the wife, is not the type of character that audiences can relate to at all. Her fear of losing her husband, Mojdeh, makes her seem perturbed by her obsession of needing to watch every move he makes. Even when we discover that she has good reason to be suspicious, we don’t feel any more connected to her, as she forgets to pick up her son from school, an oversight that doesn’t seem to cause her to reflect on the gravity of her situation. Mojdeh’s attitude and that of his lover, on the other hand, ends up coming across as more moving, as they both suffer from the great sadness their relationship causes, and from which they are also victims. The film perfectly portrays the torment caused by feelings of guilt when desire wins out over the duty of marital fidelity. One very decisive sequence, and one that tests the viewer, is the one in which the husband, stalked by his jealous wife, hits her in the middle of the street, and then immediately regrets the act, embarrassed by such despicable behaviour. The most noteworthy aspect of this film, however, lies in the effective way that lack of freedom and privacy are portrayed in a building where all the neighbours watch each other, and where everyone is at the mercy of the devastating consequences of gossip. Whatever their gender or social status, the characters find themselves forced to cheat, and keep up appearances, as a result of being so exposed to social control. 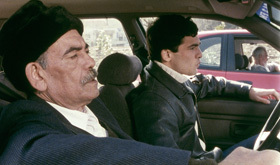 Following on from his international hit 13 Tzameti, Géla Babluani has co-directed with his filmmaker father, Temur Babluani, a film called L’Heritage (The Legacy) in which there appears to be a similar intention to appeal to audiences in developed countries, but in a much less subtle way. In this film, three Frenchmen go to the wild Georgian mountains in the former Soviet Union, with the assistance of a guide, Nikolai, who helps them with the paperwork of an inheritance. Nikolai tries in vain to dissuade these tourists from interfering, camera in hand, and in trying to correct the fate of an old man condemned to death by the mountain laws. This unleashes a fatal chain of events. The film could be seen to be a fable about the danger of westerners interfering in conflicts which they don’t understand. For its eighth edition, the festival chose to program a tribute to Moroccan cinema, the breadth of which is still relatively unknown, except for a few titles. “One Thousand and One Images of Moroccan Cinema” was the perhaps not overly original title chosen for this comprehensive program, with the institutional assistance of the Centre Cinématographique Marocain. In total, 16 feature films and seven short films were shown in a program which consisted of two parts: the first one of a historical overview of some of its most important works over the last decades of the twentieth century, and the second part, in dialogue with the first, offered films made after the year 2000. From among these one thousand and one images, which form part of the most stimulating cinema of the Magreb at the moment, the one that appears most is the problem of emigration, or in its more domestic version, the exodus from the rural areas. As over the past few years the Canary Islands have been the destination of fragile vessels carrying thousands of Moroccan and sub-Saharan immigrants trying to reach Europe, perhaps the viewers’ attention is drawn especially to the problem. What is certain, however, is that although it should be made clear that this is not the only theme, the problem of emigration is either directly or indirectly present in a good part of the films programmed in the festival. The search for survival away from home is often tied to another typical conflict in Moroccan cinema: the lack of protection experienced by women. In these films, the woman often feels helpless when her boyfriend or husband leaves home to look for a better life. The main character of Yasmine Kassari’s L’enfant endormi (The Sleeping Child, 2004) is a young married woman, who discovers that her husband, from whom she has become pregnant, has secretly migrated to Europe. A similar plight is suffered by an adolescent in Shati al-atfal al daain (La Plage des enfants perdus/The Beach of the Lost Children, Jillali Ferhati, 1991) who, upon being told of her fiancée’s departure, hits and kills him in a moment of desperation. In her case, the conflict worsens because to protect her from the villagers, her father locks her up so nobody can discover the dishonour of her pregnancy. Another factor which reinforces the portrayal of people fleeing to Europe, is the fact that many of the directors either live or have studied in big European cities, mainly in Belgium, France and Italy. That is to say, there is a strong biographical connection. This is the case with the partially autobiographical road movie A-rihla, al-kabira (Le Grand Voyage/The Long Trip, Ismael Ferroukhi, 2004), in which the young descendant of immigrants finds himself obliged to drive from the south of France, across Europe and Turkey, to Saudi Arabia to accompany his father in the sacred Muslim duty of making a pilgrimage to Mecca. Filmed in both French and Arabic, it is a beautiful film in which one can sense the generation gap between two family members who have very different views of life. Reda, worried about being accepted at university, and being cut off from his girlfriend during the length of the journey, looks on the adventure from the point of view of the culture he grew up in, and intends to take advantage of the trip by doing a lot of sightseeing. This hedonistic view contradicts that of his father, who imposes the religious purpose of the trip. There are two positions taken in dealing with the theme of emigration. Earlier productions dealt with the exodus, either to Europe or to destinations within the country, like Casablanca, the most westernised city in Morocco, as a means of survival. In more recent times, however, there is presented a different purpose to emigration. Proof of this is WWW, What a Wonderful World, a new film by Faouzi Bensaidi, which ran in the official competition. According to what the director said at the press conference, the idea for the story came from the popularity of cyber-cafes among young people. There they spend hours chatting to other young people from all over the world. One of the main characters of the film is a regular in these places, and spurred on by his virtual contact with the outside world, decides to cross the strait of Gibraltar. In one tragic-comic scene, his father negotiates the price of passage to Spain. The result is a futile attempt to escape the country, as no sooner has the boy arrives in Spain than he is promptly deported by the Spanish authorities. In the short Balcón Atlántico (Hicham Falah and Mohamed Chrif Tribak, 2003), a couple argue about the wisdom of the boy’s risking a crossing over the strait which separates Europe from Africa. The story takes place in Larache, a city in northern Morocco that faces the coast of Spain. Even weightier is the short film L’horizon perdu (directed by Laila Marrakchi), in which, yet again, a young man tells his girlfriend the news of his intentions to emigrate. His girlfriend tries to make him see reason, but once again it is in vain. As in other recent films, it does not deal with poor peasants who decide to take the risk of this suicidal journey, but young people, who despite living in an acceptable socio-economic level, feel trapped in their native country and long to escape it via emigration. Moroccan cinema, throughout its history, has dealt with the mistake of the clandestine journey, and presents the wife or girlfriend, who resists being abandoned, as the person who foresees the consequences of emigration. Its more recent films, however, point out the false hopes that youth suffers in this country, placing all their expectations in Europe, without realising that everything they are missing is available at home. Moroccan cinema finds itself at an interesting turning point. As part of the industry kept on the sidelines, its resurgence is encouraging news. It has still to be seen, whether this new Moroccan wave, as it has been called, (1) will get the attention it deserves. In any case, the contribution of festivals like Las Palmas is essential in arousing interest in a cinema that we rarely hear anything about. The real value of such a festival lies in its ability to understand the key factors in the latest trends in independent films, and especially, programming that reflects the selection criteria and wisdom of its organisers. Examples like the Festival de Las Palmas open up valuable opportunities to discover the richness of world cinema, and deserves all our admiration. Alberto Elena (ed. ), Las mil y una imágenes del cine marroquí, T&B Editores, Madrid, (Spanish-French edition), 2007, p. 10.